They say money can’t buy happiness — but it turns out it can buy beauty. Need proof? Just check out these celebrities. Before they became mega-stars, they had bad hairstyles, bumpy noses, flat chests, and — gasp — zits. Cut to a few years, and a few blockbuster movies, later and all those beauty problems just seemed to disappear. Isn’t it amazing what a few bucks and a team of dermatologists, plastic surgeons, nutritionists, fitness experts, hairdressers, makeup artists and stylists can do? Click here to see celebrities before they were famous. Now, we’re not here to criticize celebrities and make fun of their flaws. Nor are we going to give them flack for spending so much time and money on gettin’ pretty (come on, if we had the budget we’d do it too). We just wanted to take a moment to remind you that celebrities are just real people with better resources. Should you stop trying to copy celebrity hairstyles and makeup looks? Heck no! Just remember not to get discouraged if those Hollywood waves don’t look exactly like they do on the red carpet. These celebrities are proof that sometimes it takes a pro to get you to the next level of hotness (although we think they were pretty cute to begin with). Can’t wait to see who’s on the list? 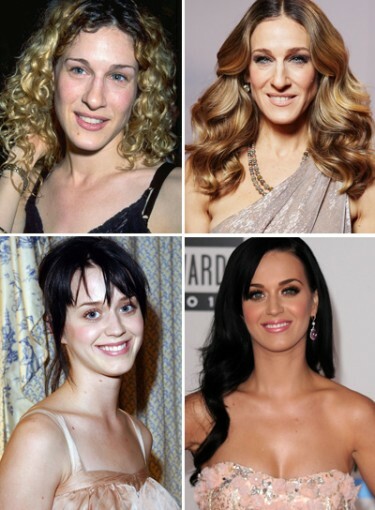 OK, here are the celebrities who have gotten major beauty boosts thanks to fame: Ashlee Simpson, Miley Cyrus, Salma Hayek, Kim Kardashian, Katherine Heigl, Katy Perry, Blake Lively, America Ferrera, Scarlett Johansson, Leighton Meester, Sarah Jessica Parker, and Jennifer Aniston.